Carelot Clubhouse, located at the Friendship School in Waterford, provides before and after school care to children enrolled at the Friendship School. The Clubhouse works cooperatively with the staff at The Friendship School to enhance the curriculum and provide quality care and education in a warm, secure and loving environment. Early childhood should be a time of fun, exploration, and discovery through experiment, touch and interaction. Our staff strives to encourage the children under our care to be actively involved in the learning process. They accomplish this by designing activities to stimulate and challenge your child according to his or her individual needs. 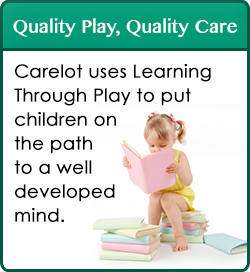 It is our philosophy that learning through play is a key part of early childhood. Learning through play is the active involvement between adults, children, and materials. Through quality play activities, the children gather valuable information as they develop important skills for future academic success! For this reason, we believe in a hands-on approach to learning which allows the children to experiment, touch, manipulate and interact with their environment every day!